Found footage horror movies were a huge deal up until recently, and there was a good deal of bad mixed in with a handful of good. I firmly believe that if found footage is done correctly, it can be very effective, but the film makers who attempt this walk a fine line to make it seem realistic without making it look cheap. Perhaps one of the most recognizable series that implements the found footage style are the V/H/S films. These were mostly seen on the festival circuit before being released On Demand and then put on home media. I’ve never seen these movies, but I’ve heard plenty about them, so let’s dive right in. Let’s start with the original 2012 film, V/H/S. A gang of criminals is hired by a mysterious source to break into an elderly man’s house to retrieve a single VHS tape. What’s on the VHS tape is not explained and is deemed unimportant, so the thieves take the job. They easily break into the house but are shocked to find the old man dead and his house covered in an assortment of VHS tapes. In order to root out the correct tape, they start to watch what this man has in his collection, but are horrified at what they find. What is on these tapes are documented cases of horror that include a mysterious murderous entity, a siren that forces herself on men to feed her bloodlust, webcam footage that shows an unspeakable lie, a stalker hunting a couple on vacation, and a house that holds a deadly secret. While the thieves watch these tapes, they become aware of strange things happening around them that may have some connection with the dead man and what he has on these tapes. So, I definitely have some things to say about V/H/S. Some of it’s good and some of it isn’t so much. Let’s get the negatives out of the way. First off, this is a found footage movie, and I believe that if found footage movies are done right, they can be a real success. This one takes that gimmick and goes a bit too far with it. The frame story of the thieves breaking into the old man’s house to find the VHS tape is fine, but it’s almost destroyed by these glitches in the tapes they’re using. This happens for the first few minutes, which didn’t really bother me, but they just kept happening. It drove me crazy. As I’m sure you’ve gathered, this is a horror anthology filled with short films. That being said, some of these shorts really didn’t do anything for me. The one that sticks out for being the most bland is the one titled Second Honeymoon. These shorts run close to 20 minutes long, so when one is really boring, it feels way longer than it actually is. This one leads absolutely nowhere, and it’s followed up by another short that also falls pretty short. This makes for a middle section of this movie that seems to drag on forever, but that’s the risk you take with anthology movies like this. 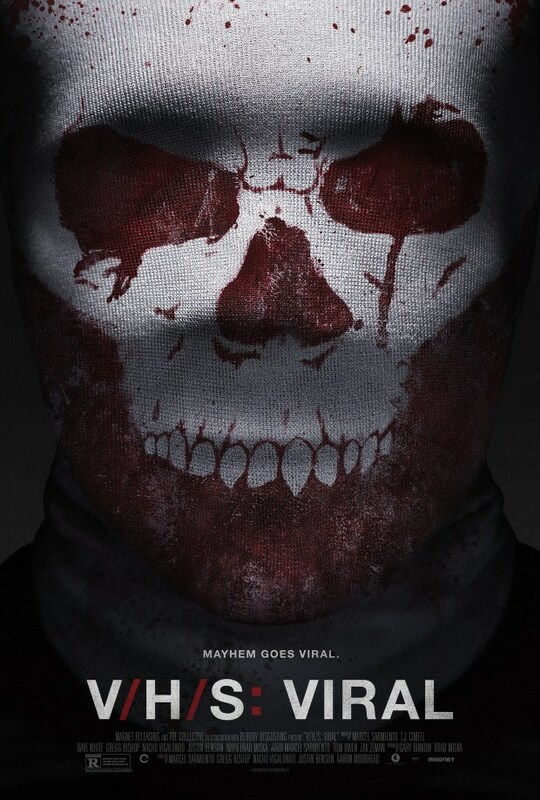 WhenV/H/S decides to get good, however, it gets real good. The general consensus from the critics I’ve heard from is that the first short and the last are the strongest, and I’m certainly inclined to agree. The first short called Amateur Night is a terrifying trip that has an excellent build up and an even better payoff. The final short called 10/31/98 isn’t the scariest of the bunch, but it does feature some pretty cool special effects that is the perfect climax to the style and mood that this movie has been building. There’s something startling about some of the imagery that’s used in this movie, and that’s probably what I’m going to remember the most about it. Since it is a found footage film, there are select elements that can’t be seen, which works since whatever you concoct in your imagination can be way scarier than the reality, but what is shown is brutal and has a style all its own. V/H/S didn’t set a new standard of horror films when it came out, but the ripple that it made was well deserved. Comparing it to something like The Witch or It Follows isn’t really fair, but for what it is, it’s a pretty impressive low budget scare fest. There are certain segments that don’t hold up nearly as well as some of the other ones, and the acting can be a bit off at times. What does hold the movie up are some genuine scares and cringes that the scarier portions of the film provide. 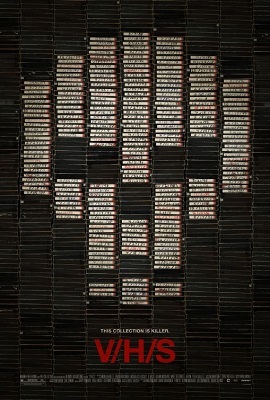 A year later, the sequel, simply titled V/H/S/2, was released. If this isn’t one of the most badass sequels I’ve seen in a while, I don’t know what is. When two private eyes are hired to find a missing college student, their investigation leads them to a house that seems abandoned, except for a set up of televisions, a laptop, and a series of VHS tapes. The investigators begin to watch the tapes which seem to show unspeakable horrors. A man sees the vengeful undead through a new high tech prosthetic eye, a man on a bicycling trail is bitten and turned into a zombie, journalists witness a violent cult hit the climax of their worship, and aliens wreak havoc on kids having a slumber party. While the tapes don’t appear to be linked, it becomes clear to the investigators that something is very wrong with the house they’re in, and terror soon strikes them as they become part of their very own VHS tape to add to the collection. Take everything you liked about V/H/S and turn it up to 11, and that’s how you get V/H/S/2. This really is one of the strongest sequels I’ve seen in a while, and certainly one of the strongest sequels in the horror genre. There are so many memorable moments in this film that it’s hard to wrap my head around all of them. If you want to talk about real horror, I’d be in trouble if I forgot to single out Timo Tjahtjhanto and Gareth Huw Evans’ segment titled Safe Haven. I have yet to watch the next film in this series, but I can say that this segment is going to be the strongest in the whole series. Take the real world horror of a Jonestown situation and add the supernatural, plus make it found footage so you’re smack dab in the middle, and you got some excellent moments of terror. I also want to single out Eduardo Sánchez’s and Gregg Hale’s A Ride in the Park, where we see through a zombie’s point of view via a Go Pro on his helmet. This is works as a zombie horror movie, but also a sort of wacky dark comedy. I do have a few complaints about this movie, and they really just have to do with the strength of a couple of the tapes. The frame narrative with the investigators really doesn’t seem like much, but the end pay off makes it all worth it, so that one gets a pass as a positive. The first short titled Phase I Clinical Trials has a good idea if it were an episode of The Twilight Zone. For a movie that has shorts like Safe Haven in it, I expected a little bit more. It has some scares, but it’s over before it begins and there’s really nothing to it. The last short called Slumber Party Alien Abduction also doesn’t hold up as well as the two that come before it. There’s some interesting sound work and the aliens have cool reveals, but it feels underwhelming after the gems that have already been shown. V/H/S/2, despite some of the segments being weaker than others, is a really good horror anthology film that is even better than its predecessor. It takes the scares, the gore, and the ideas and turns them way up to create a horror film that I may never forget. All the film makers that worked on this movie each had a specific task, and some of the made gold while the others follow up with silver. Never was I bored during this movie and it’s one that I’d love to watch again. So there’s the first two entries of the V/H/S series. Both were solid movies, but I have to give the edge to the sequel. 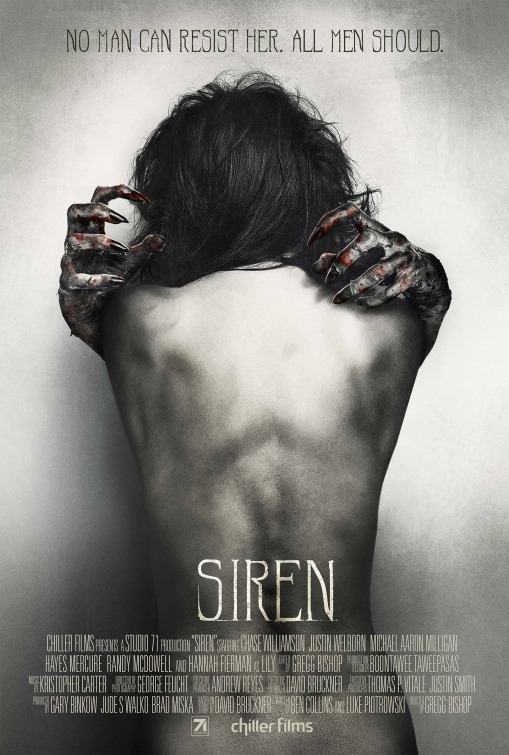 Stay tuned for my next review where I’ll talk about V/H/S: Viral and the spin off movie, SiREN.